For those who enjoy their mountain biking and cycling, the area has a great selection of routes and trails from the moderately easy to the harshest of terrain. One of the most popular locations is Wolftrax, located just outside the village of Laggan, approximately 10 miles from Sutherlands. Wolftrax is a purpose built venue and offers several routes to suit all abilities. 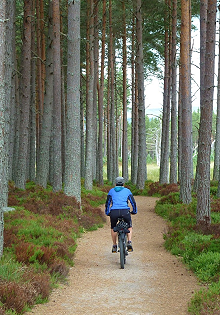 In addition to Wolftrax there are many other options available, all of which offer breathtaking rides and scenery in the heart of the Cairngorm National Park.